Plant yourself under mistletoe and there's a good chance you'll get smooched. As the tradition goes, simply hang a sprig of the symbolic plant in a foyer and underneath a kiss should commence. Legend goes with each kiss a berry should be removed. When the berries are gone, there's no more kissing. 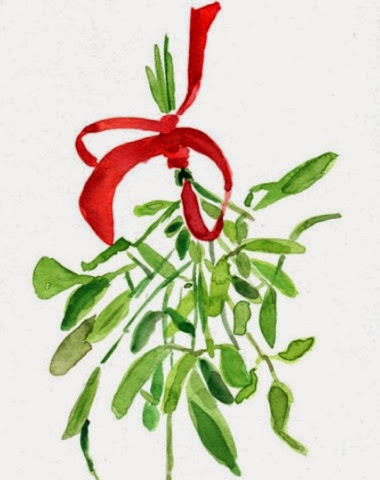 Mistletoe at Christmas time is a classic symbol of romance that dates back to ancient times. The Greeks believed couples who kissed under the mistletoe were destined to enjoy matrimonial bliss, and the Druids regarded it as a symbol of fertility. But love is never easy. Although the berries are good for birds, it's interesting that mistletoe is actually toxic to humans. So if perchance mistletoe is the spark to love....kisser beware. Despite the warnings, LOVE is the greatest adventure. So take a chance and pick up some mistletoe. Then hang on and enjoy the ride.